The newfound push this session around school safety and preventing mass shootings is reinvigorating ideas about mental health care for Texas children. But advocates often cringe when legislators make the argument that mental health care is the key to preventing mass shootings. Mental health is at the forefront of gun violence prevention conversations among Texas legislators this session, but advocates for people with mental illness are wary of that focus. After the Santa Fe High School shooting in May that left 10 dead and 13 others wounded, Gov. Greg Abbott held a series of roundtable discussions around school safety that resulted in proposals like more resources for school safety personnel and closing gaps around mental health access. He named school safety as one of his top 2019 session priorities. The newfound push among state leaders and legislators around school safety and preventing mass shootings is reinvigorating ideas around mental health care for Texas children. But mental health advocates often cringe when legislators make the argument that mental health care can prevent mass shootings, saying the rhetoric stigmatizes people with mental illness as if they’re inherently violent. Increasing access to care is just one part of the solution, advocates say. 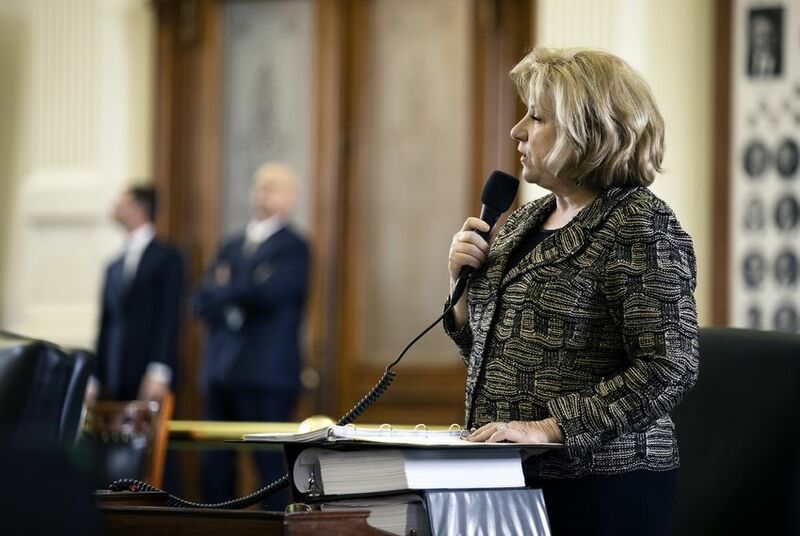 One of the high-profile mental health bills of the session is Senate Bill 10, filed by Sen. Jane Nelson, R-Flower Mound, chair of the Senate Finance Committee. Nelson told senators as she laid out her bill that it was her “best shot” at helping students in the aftermath of the Santa Fe High School shooting. The legislation is deemed a priority by Abbott and cleared the Senate in a 31-0 vote March 5. It has been sent to the House for consideration. The bill would create the Texas Mental Health Care Consortium, a $100 million initiative to bring universities and other health care providers together to connect children to mental health services. The bill also aims to promote use of telemedicine and mental health research and to expand the state’s mental health workforce. “This bill is going to help young people get the care that they need, and it will ultimately save lives,” Nelson said. She said she is troubled that “kids need to worry about there being a school shooting” and how students are dealing with issues around drug use and suicide. She said she worked with mental health experts, pediatricians and local judges to understand the scope of the problem before filing the bill and found that people often don’t know where to send kids who need help. Nelson has faced criticism and questions about potential concerns over children's data privacy, parental consent and pharmaceutical company involvement with universities. The bill has also been criticized because it does not provide mental health services — rather, it connects children and families to professionals they can see for help. Josette Saxton, director of mental health policy for Texans Care for Children, said students are more likely to see youth violence on their campuses in the form of bullying, dating violence, physical fights, or self-inflicted harm like cutting or suicide rather than "the horrific but much more jarring and visible incidents like what happened in Santa Fe." "It's a tricky area because the conversation and the attention about ensuring or addressing mental health concern especially in youth is something that is definitely needed," Saxton said. The state previously found it still needs to improve access to care for Texans, especially children, according to a final report released two years ago by the House Select Committee on Mental Health. Some of those challenges included identifying and treating mental health issues and families finding mental health professionals covered by insurance. Another challenge was that school districts were not using the Mental Health First Aid program, created to provide mental health training for public school personnel. The report found that schools were not using it because the state was not paying for travel and the course required a full day of staff time. “While there are some excellent models of collaboration between mental health professionals and educators, there is a genuine disconnect in serving public school age children with mental health issues,” the report said. States have become “the vanguard of policy” around violence prevention, especially when it comes to mental health access, but it can’t be the only solution, said Mark Barden, co-founder and managing director of Sandy Hook Promise. His organization was founded after the 2012 shooting at Sandy Hook Elementary School, where 20 children and six staffers were killed in Newtown, Connecticut. Barden said that the people committing such acts may not have a diagnosable mental illness but are instead lacking anger management and impulse control. He pointed out that Sandy Hook Promise works with schools and communities to provide trainings about social isolation, suicide prevention, and how to recognize and determine the seriousness of a potential threat. Texas legislators are looking at those other solutions, such as arming teachers, "hardening" schools by reducing the number of entrances and exits so teachers and administrators better monitor who's coming in, and increasing requirements around security cameras. They fielded testimony at a hearing in June from hundreds of people around gun storage and "red flag" orders that would allow law enforcement, family members or others to ask the courts to confiscate guns from people who are considered dangerous. Lt. Gov. Dan Patrick has previously suggested that this kind of bill would be dead on arrival in the Senate. The Sandy Hook shooting is arguably what has made the Texas Legislature more focused on mental health since the 2013 session, says Greg Hansch, interim executive director for the Texas chapter of the National Alliance on Mental Illness. He pointed out that legislators have made significant investments in mental health in recent years, including launching a community grant program for mental health services, addressing how health insurance companies offer mental health benefits and funding to renovate state mental health hospitals. While shootings at Santa Fe High School and Sutherland Springs have reinvigorated the conversation around mental health this session, “there are stronger arguments than ‘they’re going to prevent school shootings’ or ‘they’re going to reduce violence,’" Hansch said. He said some of the bills filed this session may reduce violence against others and self-harm cases like suicides and attempted suicides. He pointed out it’s more likely that the mental health legislation filed will have an impact on a smaller scale, like helping students with behavioral issues that can lead to disruptions or fights. “It’s hard to say what is going to prevent those high-profile incidents from happening again,” Hansch said.